Football fans, rejoice: The Xbox One bundle you’ve been waiting for is here, just in time for football season. Featuring an Xbox One console with a 1TB hard drive, giving you tons of space for games, a full download of Madden NFL 16 to play when the game launches on Aug. 25, plus a one-year subscription to EA Access, the Xbox One Madden NFL 16 Bundle is built for sports fans. Madden NFL 16 brings back your favorite Madden NFL modes: Connected Franchise, Ultimate Team, and last year’s new mode, Skills Trainer. Plus, it introduces brand-new modes like Draft Champions, a Madden-style take on fantasy football. New and improved controls give you way more playmaking options on both ends of the play, whether you’re a quarterback or a wide receiver fighting for the ball in the air. And the new presentation modes make the whole thing look, feel, and sound like a prime-time broadcast. All in all, you’ve got a massive newMadden NFL experience to keep you busy for many, many hours. Plus, if you’re a fan of any EA game, the Xbox One Madden NFL 16 bundle with one year of EA Access is a dream come true. On top of access to The Vault, a collection of awesome EA titles that are free to play anytime, and saving 10 percent on all EA digital purchases, EA Access gives members the chance play upcoming EA games on Xbox One for a limited time before their release and the ability to keep your progress if you decide to purchase the game. That’s right, with EA Access, you can take Madden NFL 16 for a spin beginning on Aug. 20 before the full game launches on Aug. 25 only on Xbox One. And don’t forget, Xbox One is the official game console of the NFL, so you can enjoy the NFL experience with the NFL on Xbox One App, and the ability to watch games right from your console. 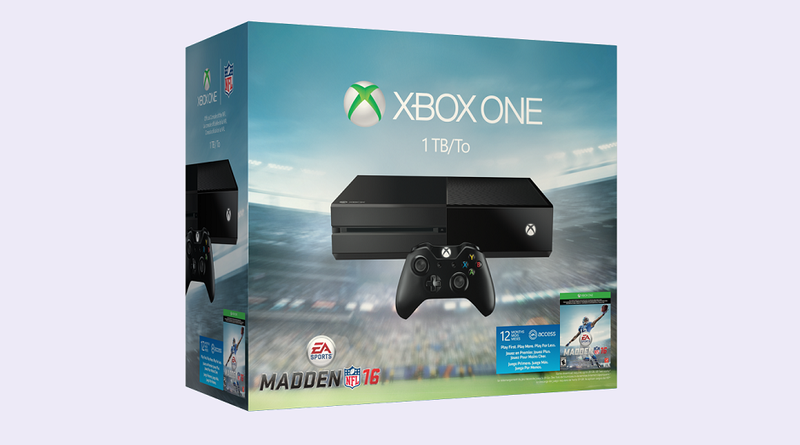 Available for $399 USD, you can pre-order the Xbox One Madden NFL 16 Bundle at participating retailers now. The bundle hits stores Aug. 18, a week ahead of the full game’s launch on Aug. 25. Let’s get ready for some football!